Hazardous Waste Treatment and Disposal Manual from C.H.I.P.S. Recognized since 1988 as the #1 technical reference in the field, this extensively revised edition arms you with updated and expanded coverage of all facets of waste management. 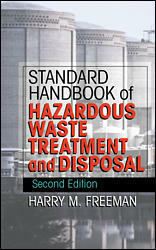 Completely updated and featuring 50% more information, the Second Edition provides you with most comprehensive and current information now available on hazardous waste management, site cleanup, and treatment alternatives. All of the chapters retained from the First Edition have been thoroughly revised and updated, nd 30 new chapters offer you state-of-the-art coverage of many management problems and opportunities. Here, in one volume, are answers to virtually any question you might have on the laws, issues, strategies, and technologies related to the generation, management, treatment, and disposal of hazardous waste.